Yosemite National Park is vast and walking there for a few September days is the most fleeting of introductions. Compared with photographers who work there over decades and in all seasons one’s own expectations must be realistic. Waterfalls were largely dry and autumn colour was just appearing. I concentrated on the smaller detail rather than the broader perspective: I liked this contrast of granite and conifers on the Vernal Fall Trail. The spring snowmelt water falls some three hundred feet over the parapet across a width of eighty or so feet. By contrast, the very modest September flow created barely sufficient mist to enhance the rock face colouration. The colour banding and chiselled forms appealed. 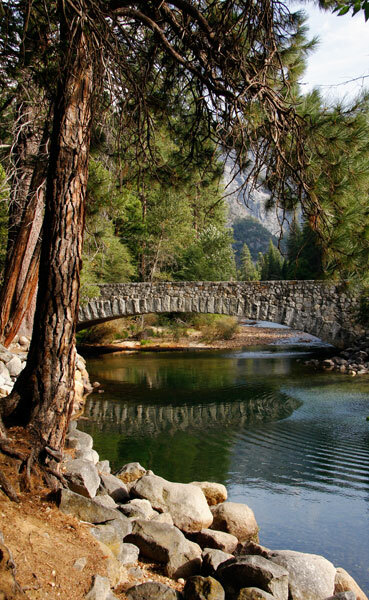 The lightly maintained Ahwahnee Lodge gardens and surrounding woodlands back the Sugar Pine Bridge across the Merced River. This placid river flow is in marked contrast to the tumult of its springtime course from its source in the Little Yosemite Valley high to the east across the Nevada and Vernal falls. 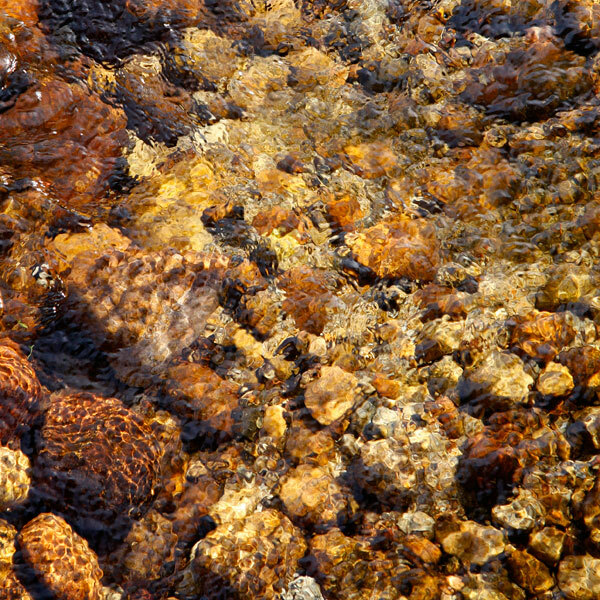 The late afternoon sun created glowing tones on water and river stones by the Sugar Pine Bridge. The tree scents, gentle air movements through branches, bird song and the sunlight flickering across the moving water encouraged rest and contemplation. 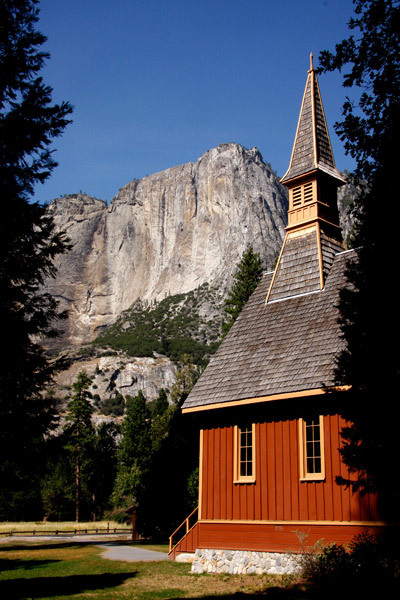 Consecrated in 1879, Yosemite Valley Chapel is said to be the oldest public building in the Park. Late afternoon sun transformed its earlier daylight ochre-orange into warm rust. 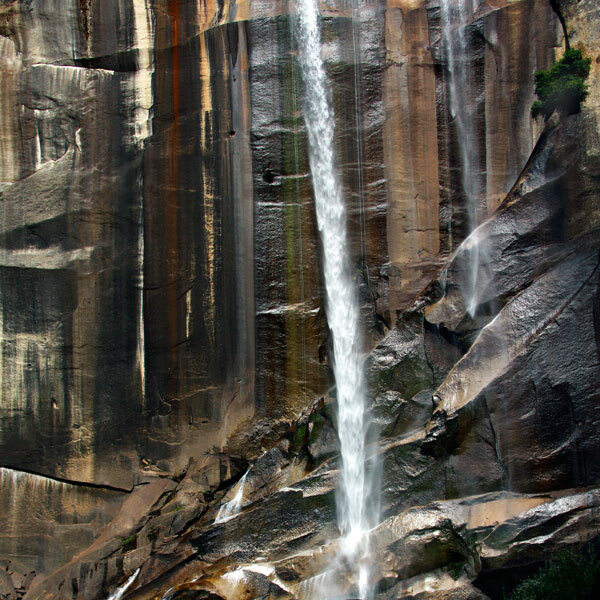 The more lightly toned wedge on the granite cliff marks the course of the Yosemite Creek as it drops 2400 feet over the Upper and Lower Yosemite Falls to a union with the Merced River. C.G. 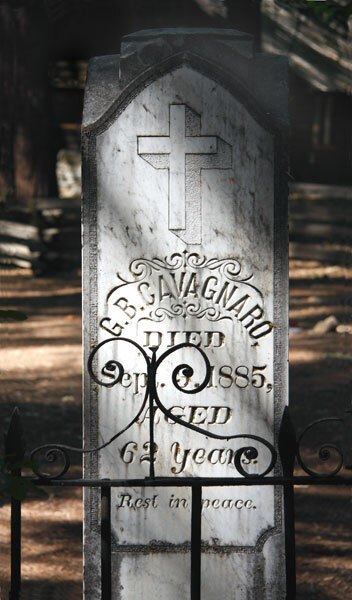 Cavagnaro was a storekeeper in Old Yosemite Village. Nothing remains of that earlier settlement sited immediately to the east of the Chapel. Once remote, the Pioneer Cemetery is now surrounded by the buildings of the present village. Nearby, the photography of Ansel Adams and others in the Ansel Adams Gallery sets one’s own images into a very critical perspective. 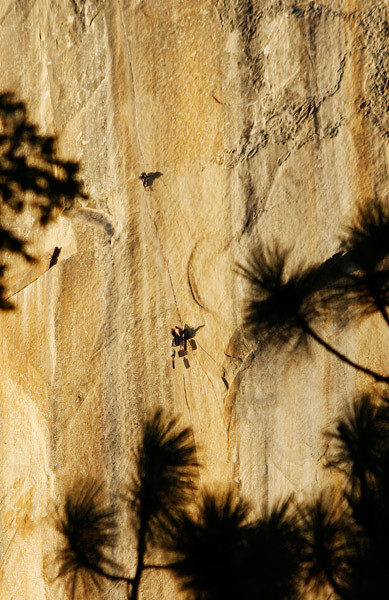 The three thousand sheer feet of granite on the Salathe Wall of El Capitan is a premier climbing challenge. Some seventy routes require from hours to days to complete. In the late afternoon sunshine this trio still have a long way to go, their suspended packs suggesting an overnight bivouac on the face. Free climbing without ropes is an increasingly popular alternative but an extension to the Yosemite Falls Trail offers an energetic but less exacting passage to the summit. 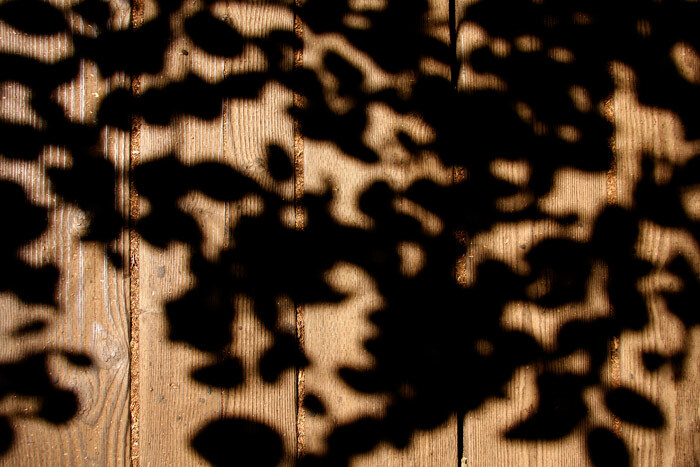 Bright afternoon sunshine stencilled this foliage abstract across the boot-polished footbridge timbers on the Lower Yosemite Falls Trail. At more than eight thousand feet Olmsted Point offers spectacular views including Half Dome, Yosemite Valley and beyond. 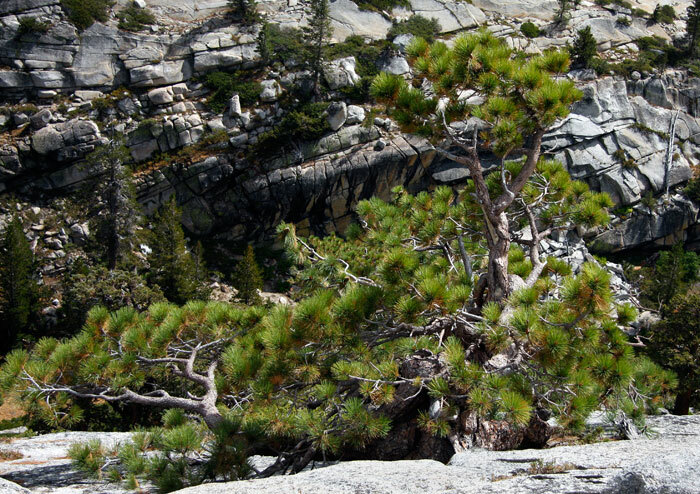 Glaciers cut and smoothed the jointed granite surfaces that support plant life growing in extreme conditions. 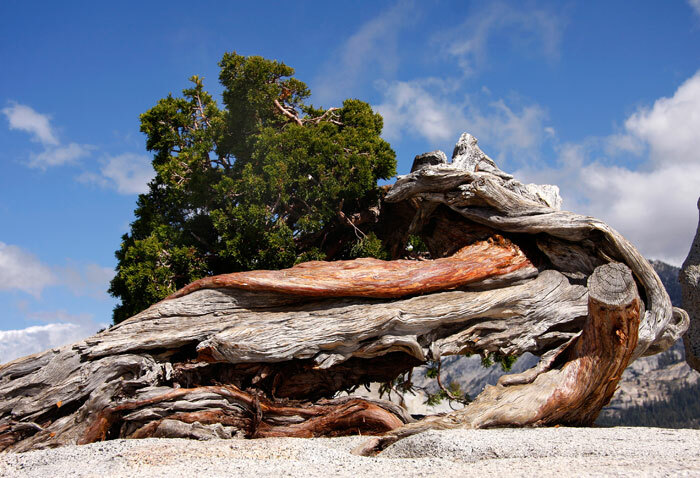 Here, a convoluted juniper trunk worn by age and weather is more horizontal than perpendicular. The Point is named after Frederick Olmsted who designed New York’s Central Park. In 1864 he was appointed as Chairman of Yosemite’s first Board of Commissioners after President Lincoln signed the Park Bill into law. 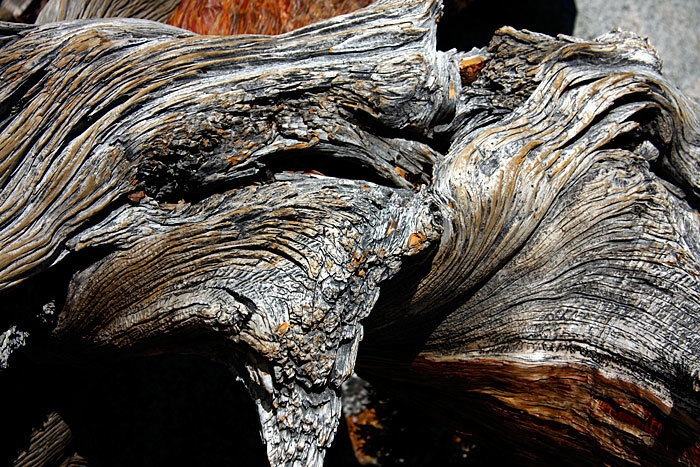 This is a detail from the bleached lower trunk of the juniper in the previous image. The Point lies roughly halfway along the Tioga Road between the western Crane Flat and eastern Tioga Pass entrances to the Park. 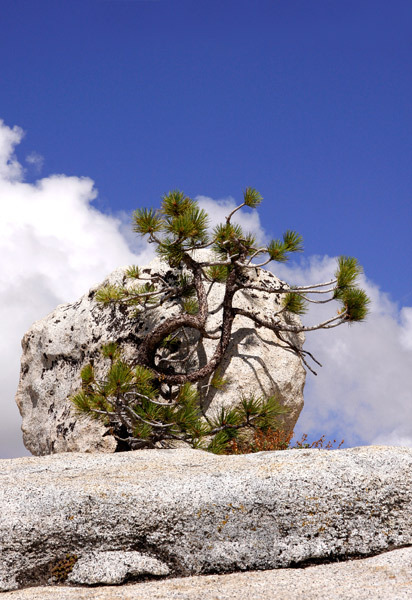 A small Jeffrey Pine is both sheltered and supported by an erratic granite boulder set high on the formation. Another Jeffrey Pine has established itself in a more sheltered location on the side of a gully giving some shelter from the prevailing wind. 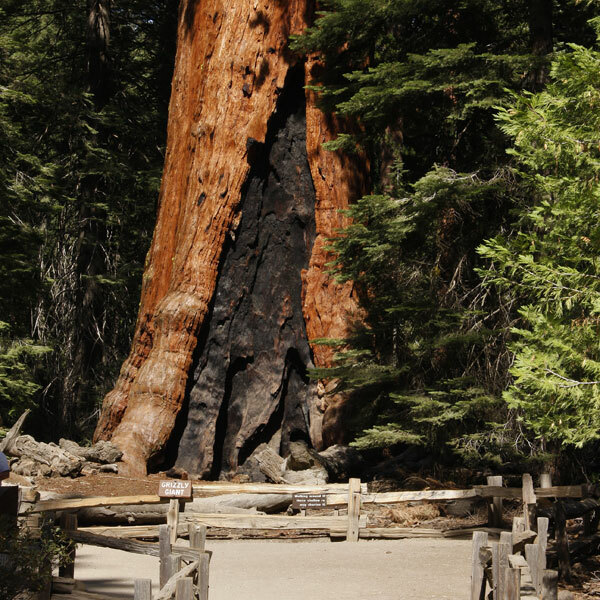 The Grizzly Giant is one of nearly five hundred sequoia trees in the Mariposa Grove. Some two hundred feet high and thirty in diameter at the base, it’s estimated to be one thousand eight hundred years old, ‘give or take a few centuries’. 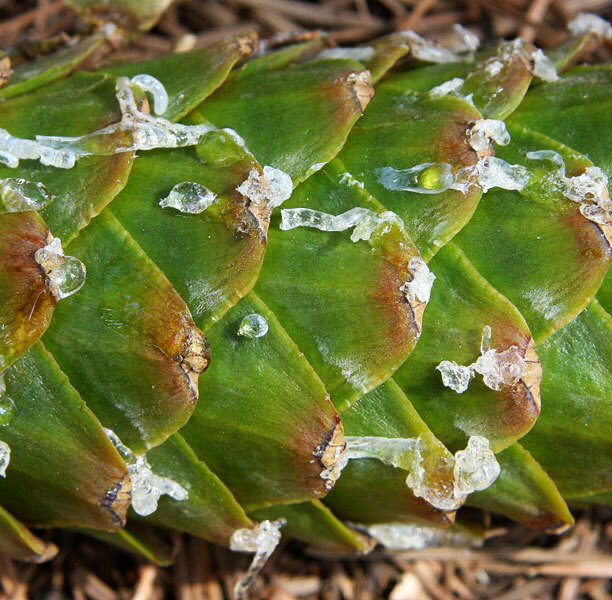 Natural fires are a crucial factor in the sequoia growth cycle, opening seed cones and clearing ground debris from the soil surface to enable germination. Side effects are evident in the charred base cleft and elsewhere in the woodland. 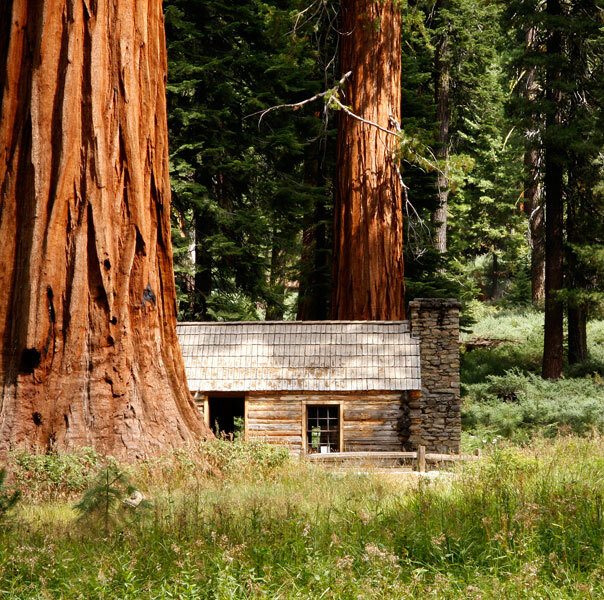 Galen Clark was associated with Yosemite and the sequoia trees for almost sixty years from 1855. He is credited as the first to explore and document individual sequoias in the Grove and campaigned to provide protection for them. 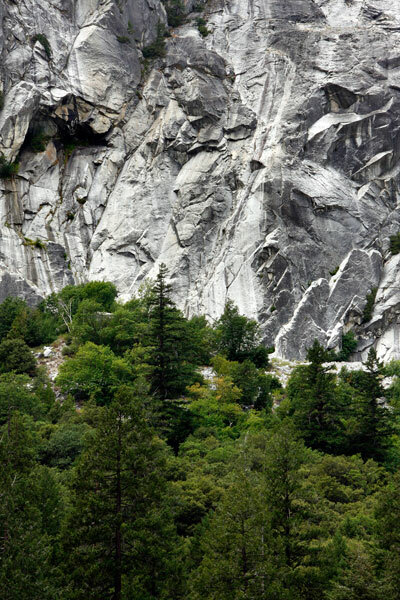 On the 1864 formation of the Yosemite National Park he was appointed as Guardian, a post he held for twenty-four years. This cabin is named for him and serves as a museum; in this image it acts as a measure against the trees. 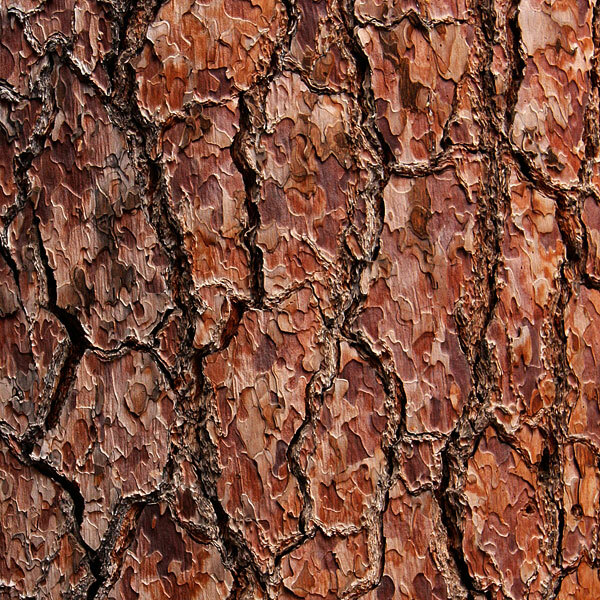 Reaching two hundred and more feet in height, the sugar pine is one of the tallest forest trees. Exceeding all others, its seed cones can achieve eighteen inches and more in length. This is a section from a fallen but fresh green specimen. A small area of bark framed on a relatively young Ponderosa Pine. The forest floor was deep in the debris of needles, cones, bark, branches and whole trees. The variety of form, colour, pattern and texture was remarkable. Low growing flowering plants and shrubs grow in clearings and wherever sufficient daylight penetrated. 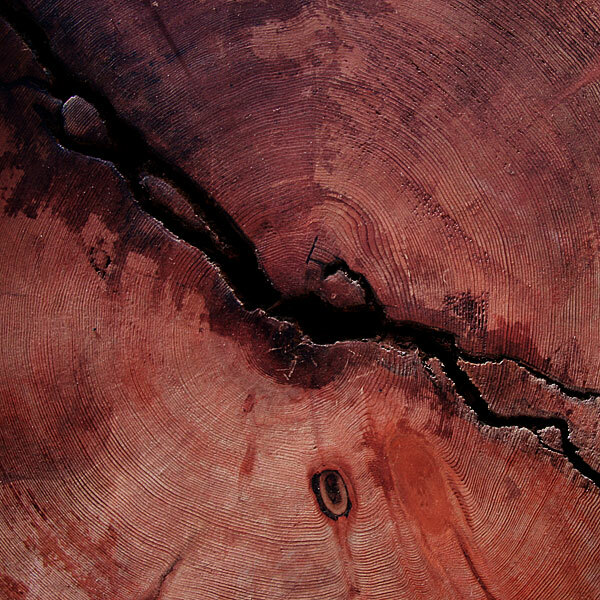 Here, a centred detail was taken from the sawn and smoothed base of a fallen tree. The caressing hands of passing walkers no doubt burnish the deep red patina. We walked the trail following the Tenaya Creek to Mirror Lake and beyond. Unsurprisingly, the September river flows were meagre and the lake was a sand bowl. 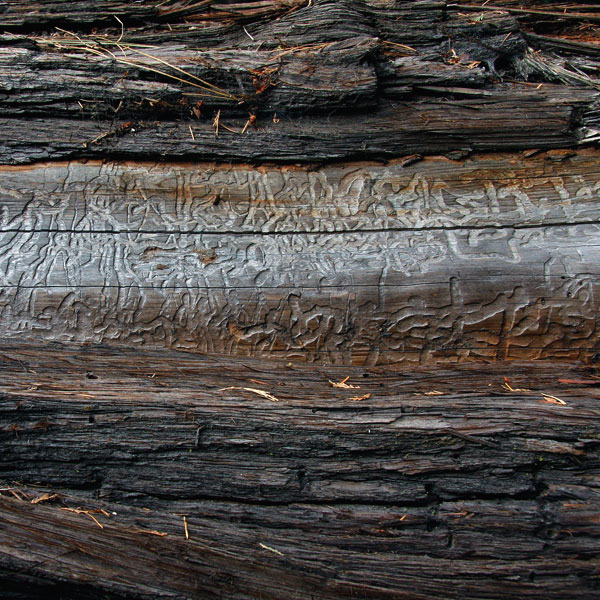 Bark beetle larvae created this abstract relief within a once living tree, now in beautifully dark decay.